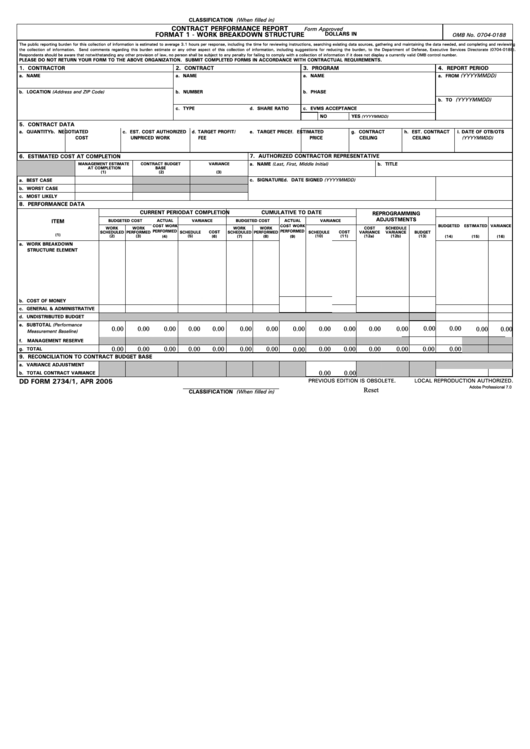 Download a blank fillable Dd Form 2734/1 - Contract Performance Report - Format 1 - Work Breakdown Structure 2005 in PDF format just by clicking the "DOWNLOAD PDF" button. Complete Dd Form 2734/1 - Contract Performance Report - Format 1 - Work Breakdown Structure 2005 with your personal data - all interactive fields are highlighted in places where you should type, access drop-down lists or select multiple-choice options. the collection of information. Send comments regarding this burden estimate or any other aspect of this collection of information, including suggestions for reducing the burden, to the Department of Defense, Executive Services Directorate (0704-0188). Respondents should be aware that notwithstanding any other provision of law, no person shall be subject to any penalty for failing to comply with a collection of information if it does not display a currently valid OMB control number. PLEASE DO NOT RETURN YOUR FORM TO THE ABOVE ORGANIZATION. SUBMIT COMPLETED FORMS IN ACCORDANCE WITH CONTRACTUAL REQUIREMENTS.